I arrested Bobby Kielty today. Call it a citizen's arrest. I took one look at him at the A's Fan Fest, and I instantly realized that a terrorist could kidnap him, trade him to Pittsburgh, and create a weapon that could injure or kill thousands, if not millions, of innocent people. It is a danger that in good conscience, I could not allow to persist. 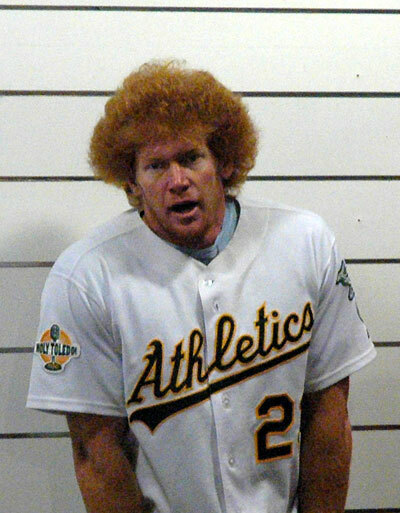 Rest assured, Bobby Kielty is safe, and will not be harmed. I am detaining him merely to protect the innocent. When I have received written proof that Kielty cannot and will not ever wear that hideous new red Pittsburgh Pirates uniform, I will release him. I realize that my actions have consequences. I am prepared to accept those consequences, whatever they may be, in order to save the lives of others. The needs of the many outweigh the needs of the few, or the one. I am not sure when you will see me again here at Catfish Stew. The good news is that The Pastime author Ryan Armbrust has agreed to join the staff of Catfish Stew. I'm sure you will find him to be a fine young writer, with many lovely charts. I am excited to have him join us, even in these dangerous and difficult times. lol Poor Ronnie Mac! I actually got to be a part of Fan Fest this year, all the way over here in Jersey City, NJ. A's had a live feed going on their mlb website. Some of those questions during the Q and A's were just downright scary. "He's 6-foot-5... 6-foot-9 with the afro." And welcome, Ryan. As the last guy Ken added, I've done my level best to ease your transition by setting an especially low bar for newcomers. Did the cheerleader's dad design the Pirate uniform? i'm generally a fan of red hair, and a fan of the 'fro, but in kielty's case, it needs to go. Hey, ho, we won't fro! Hey Ken, I'm pretty sure you got Carrot-top, because I just saw Bobby Kielty onstage holding a phone receiver attatched to a toilet seat, raving about his "commodophone".